Explanation for non-German-powered™ readers below the fold. A "Tante Emma Laden" (Aunt Emma shop), is a "mom and pop store" in German. I assume the delicious irony of applying this term to a series of heavily-barricaded automats bathed in morgue-like fluorescent light will not escape my readers. But it is entirely possible that the vending machines are filled by an authentic Aunt Emma person. By the way: a Deppenapostroph in “Tante Emma‘s 24h Kiosk” would’ve been the Tüpfelchen auf dem i (= the icing on the cake). 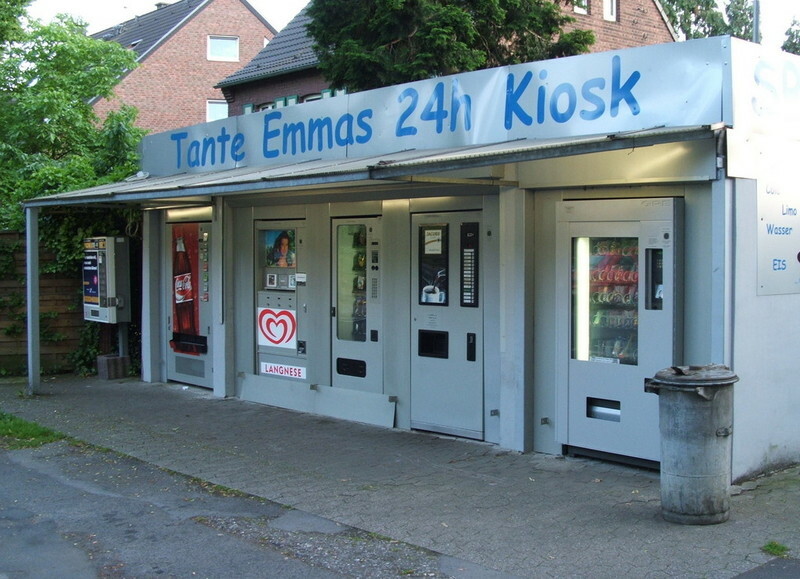 Again, correct spelling would be with hyphens: “Tante Emmas 24-h-Kiosk”, “Tante Emmas 24-Stunden-Kiosk” or, my favourite, “Tante Emmas Vierundzwanzigstundenkiosk” (no hyphens, sorry). Is that font really MS Comic Sans? Well, then at least it’s a typical “Tante-Emma-Schild”.